General materials for use in the exam room – What can we help you with? 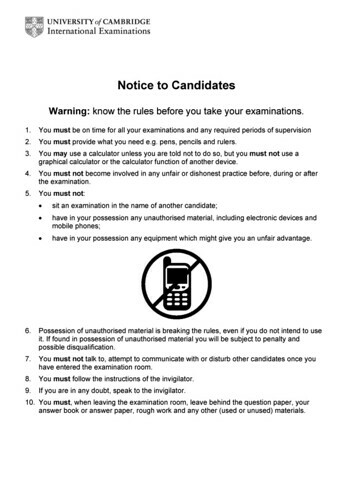 Poster outlining Cambridge exam rules and regulations for candidates. Two copies per school. Before the exam period starts, make sure you display a copy of the Notice to Candidates poster outside and inside all exam rooms. 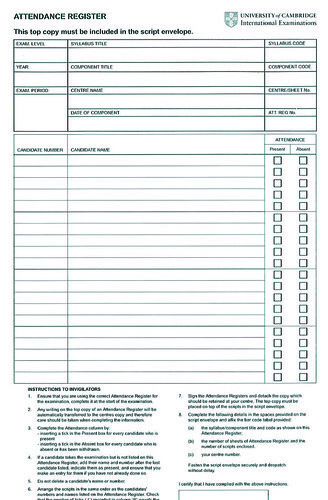 The attendance register is a formal record of all the candidates registered to take each exam. Before the exam starts, use the attendance register to record whether the candidates listed are present or absent. Return the top copy with the exam scripts in the script return envelope. Keep the bottom copy for your own records.